Magnesium caprylate: Magnesium is an important mineral, essential for the use of vitamins B1 and B6, for bone, protein, fatty acid formation and a number of other body functions. Magnesium caprylate is a medium chain fatty acid. Caprylic acid (as magnesium caprylate) is best taken in conjunction with a low yeast and low sugar diet. Cinnamon bark powder: Cinnamomum zeylanicum Blume or cinnamon bark powder contains the active constituents tannins, essential oil and coumarin. Clove powder: A fragrant spice, Eugenia caryophyllus Spreng or cloves contain a heavy volatile oil, a camphor resin, flavonoids and sterols. Shiitake mushroom powder: Lentinus edodes are widely eaten as a food and used for health purposes in the Far East and South America. They have more recently grown in popularity in the West as a result of their general classification as a "superfood". Active constituents include triterpenes, polysaccharides and lentinan. Garlic powder extract: Allium sativum or garlic contains allicin, amino acids, volatile oils, B group vitamins, iodine, selenium, sulphur and other minerals. Bentonite clay powder: Bentonite is a form of aluminium phyllosilicate derived from volcanic ash and consisting mostly of montmorillonite or other smectite minerals. In recent years, bentonite has been increasingly used by practitioners of alternative medicine as an internal cleanser. It is highly absorbent (it absorbs nearly 5 times its weight of water and at full saturation occupies a volume of 12 to 15 times its dry bulk weight) and is thought to work by binding to toxins and organisms in the body, and may help the body to remove them through waste. Pumpkin seeds: Pumpkin seeds (Cucurbita pepo. Cucurbita maxima, Duch.) are a rich source of vitamin A, B vitamins, minerals (such as calcium, iron, phosphorus and zinc) and other nutrients such as linoleic acid and cucurbitacins. Chicory root: Also known as Cichorium intybus, the root of this garden vegetable has a long and well-documented history of being used to support the liver and the other cleansing systems and organs of the body. It contains vitamin A, B-vitamins and vitamin C (a powerful antioxidant), as well as minerals such as potassium. It is also rich in fibre and contains probiotic oligosaccharides. Grapefruit seed: Grapefruit seed extract, not to be confused with grapeseed extract, contains beneficial bioflavonoids including hesperidin. Cayenne: Also known as red pepper, chillies and Capsicum minimum in Latin, this "hot" herb comes from the bright red dried ripe pods. The powder is known as cayenne pepper. Regarded by professional herbalists as the purest and safest stimulating herb known. Fenugreek seed: Trigonella foenum-graecum or fenugreek is a herb which contains flavonoids, volatile oil, saponins and alkaloids. Olive leaf: Olea europea or olive leaves contain a biologically active compound called elenolic acid. Certain foods, such as cinnamon bark, garlic, pumpkin seed, fenugreek seed and grapefruit seed, have a natural internal cleansing effect on the body. 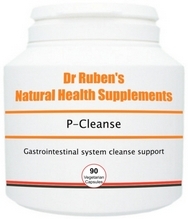 This is therefore an ideal supplement to help maintain healthy gut flora (friendly bacteria). 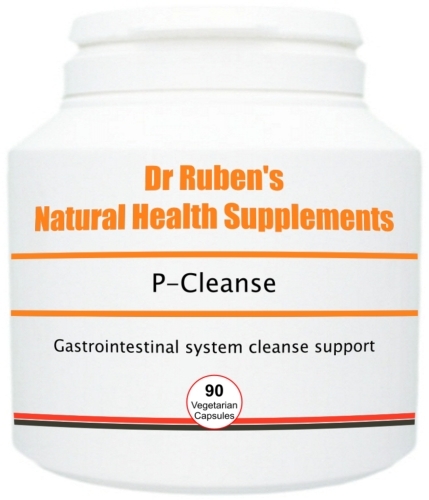 P-Cleanse is also the ideal natural food supplement to accompany you on your exotic travels abroad or to use on your return from countries where water quality and/or hygiene standards are not ideal.